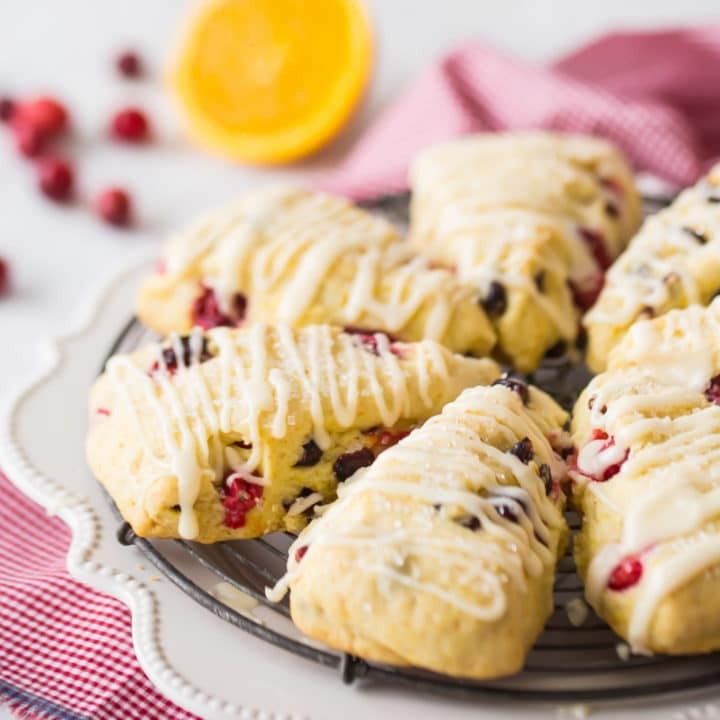 Bake up a batch of these moist orange cranberry scones! With a sunny citrus flavor and a balance of tangy fresh and sweet dried cranberries. I’m loving that we are finally getting into that time of year where we can bake with seasonal, wintry ingredients like cranberries, citrus, and spice! These flavors just scream winter holiday to me. I’ve shared a lot of different scone recipes here on Baking a Moment, including these pumpkin scones, these petite vanilla bean scones, and these double chocolate scones. 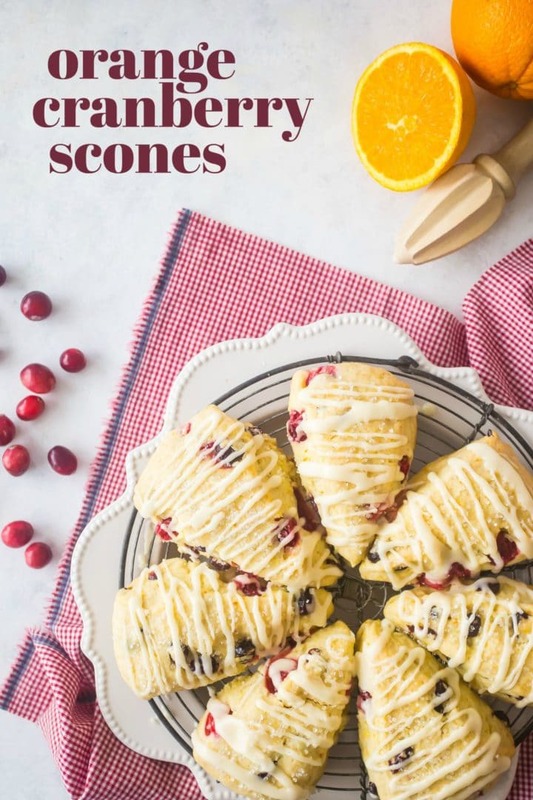 But I’ve been wanting to create an orange cranberry scones recipe forever!! I used to love to stop at Starbucks to get an orange cranberry scone and a pumpkin spice latte every year when I started my Christmas shopping. It was such a great way to kick off the holidays for me! But now I don’t even need to make that stop, and neither do you! 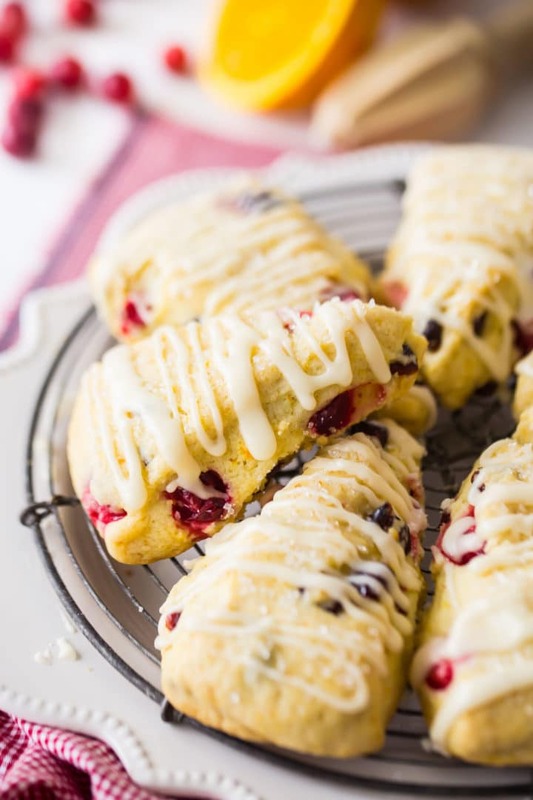 You can whip up a homemade batch of orange cranberry scones any time you want. And they taste even better than Starbucks! 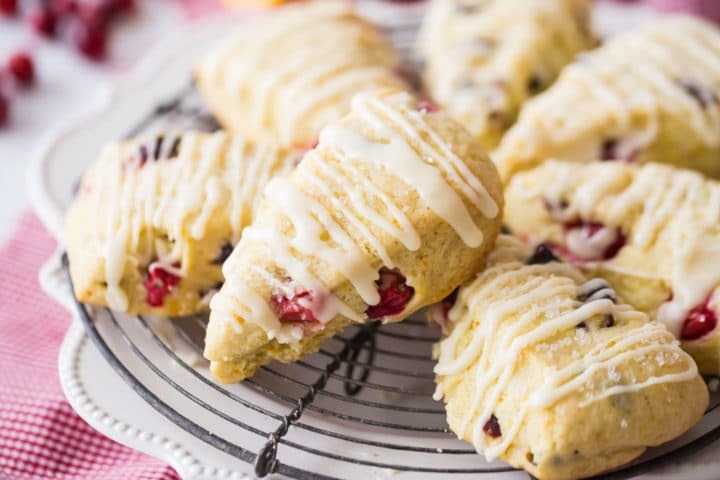 These scones whip up in a snap! The dough comes together in about 10 minutes, so you can have a homemade, freshly baked breakfast treat in about a half hour. Start by placing the flour, sugar, orange zest, baking powder, and salt in the bowl of your food processor. Give it a few pulses to combine everything, then pulse in the butter until the mixture resembles coarse crumbs. With the food processor running on low speed, drizzle in the cream. As soon as the dough starts to gather itself into a ball, turn the machine off, and (on a floured surface) pat the dough into a rough rectangle shape. Press in the dried and fresh cranberries, and give the ball of dough a quick knead, to distribute the fruit all throughout. Next just pat the ball of dough into a disk shape, and cut it into 8 equal wedges. Pull the individual scones apart from each other a little bit (they will spread as they bake). If you’d like you can sprinkle them with clear sparkling sugar, to give them a little extra sweetness and a frosty, wintry look! These scones will bake in the oven until they’re set and just beginning to turn golden brown. Do you have to have a food processor to make these scones? I really like making scones in the food processor, because it’s so easy and it gives them a nice, uniform appearance. But if you don’t have a food processor, you can use a pastry blender to cut in the butter. Or, you can do it the old-fashioned way, with two sharp knives. If you’re looking to go dairy-free or vegan, use your favorite vegan butter substitute, and non-dairy creamer in place of the heavy cream. Scones are great for a quick, on-the-go breakfast, or for brunch. I even love them for an afternoon snack! They taste great with a hot cup of coffee, tea, or hot cocoa. I don’t really think this scone recipe needs anything extra. Sometimes I’ll recommend topping scones with lemon curd, jam, or apple butter, but this recipe has plenty of flavor and sweetness just as is. The garnishes are completely optional, but I love that extra bit of sweetness and citrus flavor that you get when you frost these scones with clear sparkling sugar, and drizzle them with a simple orange glaze. CAN ORANGE CRANBERRY SCONES BE MADE AHEAD? One of the reasons I love baking scones so much is because they hold up so well! Bake a big batch and you’ll be nibbling on them all week long. They will keep (loosely covered) at room temperature for a few days. After that, they can go into the fridge, where they should last for at least another week. Scones are perfect for the freezer as well! Allow them to cool completely before you pop them into a zip-top bag and freeze. 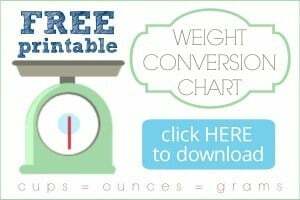 Whenever you want to indulge, just pull one out and warm it in the microwave for about 15 to 25 seconds. I think you are really going to love these homemade orange cranberry scones! They’re just perfect for this time of year, and so simple and quick to make! Place the flour, sugar, orange zest, baking powder, and salt in the bowl of a food processor, and pulse to combine. Cut the butter into pieces, and add to the food processor. Pulse the food processor until the mixture resembles coarse crumbs. With the food processor running on low speed, stream in the cream. When the dough has gathered itself into a ball, turn off the food processor and turn it out onto a lightly floured surface. Knead in the dried and fresh cranberries, and flatten the dough into a disc shape, about 1 1/2-inches thick. Score the disc into 8 triangles with a knife, and pull the triangles slightly away from one another (allowing about 1/2-inch in between). Sprinkle the unbaked scones with clear sparkling sugar, if using, and bake for 20 to 24 minutes, or until set in the centers and slightly golden on the bottoms. To make the glaze (optional), stir the powdered sugar and orange juice together until smooth, then drizzle over the scones. I had never made scones from scratch before and this was a great recipe for a first try. They were easy to make and tasted wonderful. I made the glaze according to the directions and it never really got thick enough to drizzle on in a zig zag pattern like the picture. I even added more confectioners sugar. It just spread over the cookie and gave it a shiny look. I also used turbinado sugar because I didn’t have the sanded sugar. These changes weren’t a big deal and did not take away from the taste of the scones and they still looked nice. One other thing , I used only dried cranberries. I like this recipe so much that I’m baking another batch tomorrow.